WASHINGTON — When Julian Hernandez, 18, of Cleveland, began the college application process recently, he found something didn’t add up — colleges were telling him his Social Security number didn’t match his name. With the help of a guidance counselor, he found out why: He was on the database of the National Center for Missing and Exploited Children. Hernandez was 5 when he was reported missing from his home in Vestavia Hills, Alabama. Police suspected that he had been abducted by his father, but he hadn’t been seen since his father, Bobby Hernandez, didn’t drop him off at preschool on Aug. 28, 2002, Alabama’s ABC13 reports. 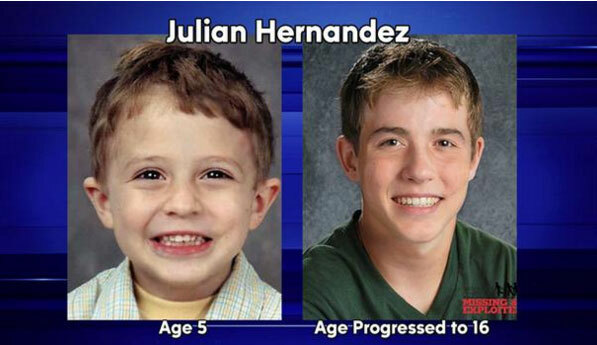 Julian had been living in Cleveland with his father, a woman and two other children. ABC 13 reports that the FBI says the two weren’t living under their real names. Bobby Hernandez was arrested in Ohio. AL.com reports that he’s charged with tampering with records in Ohio to get a driver’s license and that police say he’ll face abduction charges in Alabama. “I’ve been doing this 25 years and it’s something I’ve never experienced before,” Lt. Johnny Evans, of the Vestavia Hills police, told Alabama’s WVTM. “That’s the reason you never give up and you keep looking.” He told ABC13, “I can’t express in words” how Julian’s mother felt when she got the news. Court records show that Hernandez was declared indigent in Ohio. A message seeking comment was left at court-appointed attorney Ralph DeFranco’s office Thursday. Prosecutor’s spokesman Joseph Frolik said the investigation is ongoing, but he had no additional comment Thursday. A preliminary hearing is set for Nov. 12. When she reported him missing, she told police that Bobby Hernandez had come over to watch Julian, Evans said. He left her a note saying he had taken him and that was the last time she saw her son, Evans said. The two were not married, and police tried to locate Bobby Hernandez but couldn’t find an address, Evans said. Officers received “hundreds of leads over the years of where he might be, from Florida to out of the country — Canada — and we followed up on every one of them, and they all turned out to be a dead end until I got the call Monday,” Evans said. What happens next, in part, will be up to Julian Hernandez. “He is 18, he is an adult, so it’s kind of up to him now as to whether he wants to come back,” Evans said.